Bausum & Duckett Electric LLC is a full-service electrical contractor proudly serving both commercial and residential customers in Chesapeake Bay region, from northern Virginia and Metro DC to the Eastern Shore as well as Delaware. Founded in 1960, Bausum & Duckett has developed an unsurpassed reputation for service, quality and professionalism. Whether you need electrical system design and/or installation for a construction project, electrical repairs, lighting, or generators, you’ll receive the highest quality services from a name you can trust. A proud member of the community since 1960, we look forward to serving you. Bausum & Duckett Electric LLC — Powering solutions since 1960. Bausum & Duckett provides comprehensive electrical services to homeowners and the commercial market within the Maryland, Delaware, Washington D.C. and Virginia region. With two offices to serve you — Edgewater, MD and Delmar, DE — a fleet of service vehicles, and more than 100 employees, we can take care of your planned or emergency electrical needs quickly and efficiently. Harold Bausum & Jimmy Duckett formed Bausum & Duckett Electric LLC in June of 1960, specializing in residential electrical projects. When Jimmy left the company to venture out on his own, Harold carried on, growing the company from a small mom and pop business to a larger organization that also specialized in commercial work. In 1983, four additional owners came aboard, expanding the company’s geographical territories increasing services and specialties. In 2003, Tim Holt became the sole owner of Bausum & Duckett and has provided 42 years of dedicated service. 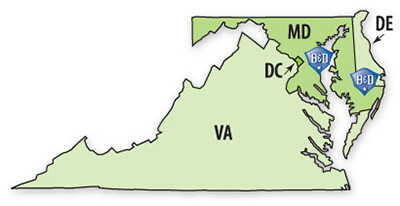 Today, the company has two offices—the original in Edgewater, MD and a branch in Delmar, DE—allowing us to serve the entire Maryland, Virginia, Washington DC, & the DelMarVa region. Today, as owners, President Mark Llewellyn, Sr. Vice Presidents Tommy Luc and John Dorsey carry on Bausum & Duckett’s commitment to exceptional service, superior workmanship and professionalism. Thanks to a highly skilled and courteous staff, the company maintains its premier reputation, continues to strive for new ways to meet customers’ needs and keeps abreast of changing technologies. While electrical technology is always evolving, our approach remains constant: We take great pride in our final product—no matter how big or small the job. Honor and uphold the principles of free enterprise, service, and integrity. Our record of progress and growth attests to the validity of these objectives as well as to our success in living up to them. 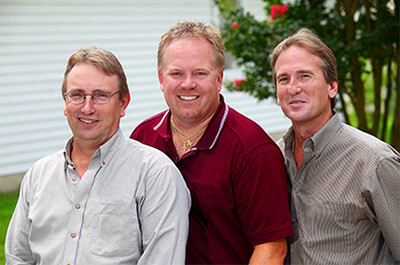 The Bausum & Duckett management team touts more than 100 years of combined experience. Members of our team are graduates of the Associated Builders and Contractors Association (ABC) program; are certified electricians; and have the expertise and training in specialized areas of the trade to keep Bausum & Duckett up at the forefront of the latest technology and advancements. Our management team remains hands-on, easily accessible, and focused 100% on customer satisfaction. Mark Llewellyn started with Bausum & Duckett in 1981 in the residential department. He graduated from the Association of Building Contractors apprenticeship program in 1986. In 1988 he took the position of assistant residential manager, then manager & estimator of the residential & service departments in the following years. In his current position, he oversees westerns shore office operations, along with the residential and service departments. His areas of expertise include custom home and apartment wiring installations along with code compliance and updating. In his free time, Mark, married and the father of two older children, enjoys tinkering with his 1967 Mustang, boating, crabbing, and spending winter weekends at Deep Creek Lake. Tommy Luc joined the Bausum & Duckett team in 1985. During his career at Bausum & Duckett, he’s held numerous positions and has well-rounded expertise in all aspects of electrical contracting covering service work, residential and commercial installations. In his current role, Tommy brings his hands-on experience to the management of our commercial construction department—ensuring quality projects, building and managing client relationships, and staying at the forefront of changing technology. Tommy is a Licensed Master Electrician in numerous States and jurisdictions. In his free time, you can usually find Tommy and his wife Lora on their motorcycle roaming the back roads and country side — also a father of five and avid outdoorsman he enjoys family time on the water and in the woods of West Virginia. John Dorsey is a third-generation electrical contractor with 38 years of electrical trade experience. He has graduated from Associated Builders and Contractors Apprenticeship program and has degrees from Purdue and Clemson Universities. He joined Bausum & Duckett in 1990 as a foreman and has held several positions since then, including manager and estimator. As a Vice President of the company, John oversees day to day operations for the Delmarva Division. Even with his added responsibilities, he still enjoys and finds time to manage projects and estimate. John has been married to his wife Nancy for 29 years, and is the father of two daughters. John is also an avid outdoorsman, enjoys off road activities in the mountains of Colorado, hunting, boating and spending time with his two granddaughters. Anthony Hughes joined Bausum & Duckett in 2009 and worked his way through the IEC Apprenticeship program to become a licensed electrician. He has experience across residential and commercial, from new construction to managing service calls, repairs and renovations. This broad background gives him the in-depth expertise and strong understanding of customer needs to smoothly handle projects large and small. A lifelong Anne Arundel County resident, Anthony was born and raised in Davidsonville. Today, Anthony lives in Edgewater with his wife and two children. When he’s not working, Anthony enjoys hunting and riding dirt bikes.